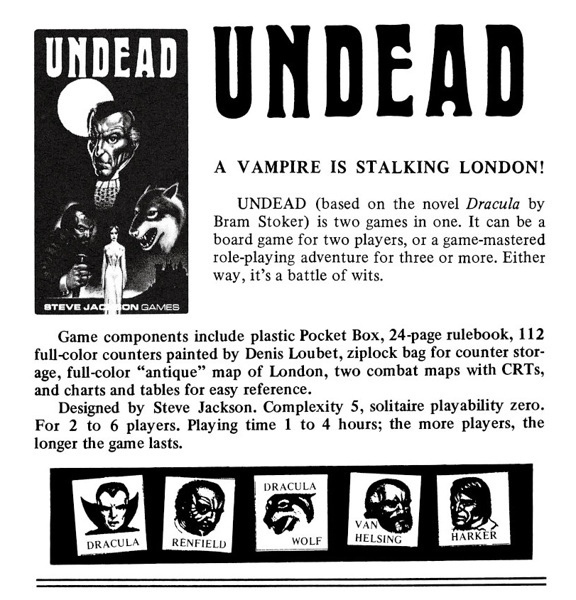 Daily Illuminator: Steve Jackson's Undead Returns! February 8, 2019: Steve Jackson's Undead Returns! "The other new one is my own project. It's not as far along, just because I've been getting CAR WARS ready for the playtesters . . . but it's getting there. This one doesn't have a name yet – but it was inspired by Bram Stoker's Dracula. The title seems a natural – but after I'd worked on it for a while, I understood why it hadn't been done. There are problems with the original Dracula story, as far as gaming goes. Some of them aren't ironed out yet – but it's just a matter of time. Right now, the vampire player gets to move around on a map of London, trying to conceal his coffins and find new victims. His pursuers search for his hideouts while trying to alert the city to the danger. When the players meet, they battle. Eventually, the "great Un-dead" dies (or is driven away) – or the vampire hunters bite the dust instead. I doubt this one will have a solitaire version, unless I get inspired. Right now, it looks like it will work OK with two players; better with three (vampire, the hunters, and a referee). Or there can be more than one hunter-player. The game will draw from both role-playing and wargame concepts. I've got a couple of ideas that came too late to be included in Fantasy Trip . . . so I'll work them in here. Basically, this is going to be an FRP game that works itself out in one or two sessions, rather than continuing indefinitely. Eventually, somebody will win . . . and you can start another game later." If you've never before played Undead, this is your chance to add the game to your collection and give it a try. The Pocket Box campaign closes on March 1, so there's still time to join and grab this . . . as well as several other classics including Car Wars, Illuminati, and Ogre. Just how many Pocket Box games will be offered as part of the Kickstarter project? We won't know until the end, but your support helps unlock stretch goals and add more to the campaign. Join us today!